Listening to Kenny Young's first full-length album Simple Things presented this listener with more than a little consternation when writing commentary. I think I'm still ambivalent to this veteran singer-songwriter from New Jersey. By overview, a listen to the cover of the Allman Brothers' Midnight Rider will give you a sense of Young and Simple Things things direction: southern and blues flavored American melodic rock. Honestly, I was skeptical seeing Young posing with an acoustic guitar within the CD booklet. Putting a guitar in the hands of a singer or songwriter can be like a putting a gold ring in a pig's snout: it don't belong. However, Mr. Young is a self-taught accomplished guitarist, and contributes acoustic guitar to several songs on this project. As a songwriter, he has lyrical prose that expresses honesty and feeling. Where Do We Go From Here, We'll Find Love Again, and Simple Things display both Young's wisdom and talent. To song composition, he's a mere contributor to the arrangements, mostly handled by producer Bob Kimmel. Nevertheless, the music throughout Simple Things is still satisfying and entertaining. My dilemma, and ambivalence, comes with Kenny Young as a singer. Certainly, he's talented: there's a definite soulful and deliberate delivery to his performance. I don't think there's a single song where Young does not perform well. However, with a few exceptions, Young sounds mechanical and dispassionate. On the aforementioned songs and others Kenny barely rises above the music. Krazy and Going Home might be the exceptions. Actually, throughout Simple Things, the music betters him. It sounds like Young did not get enough sleep the night before recording, was indifferent to his listeners, or quite bored with himself and the songs. By now I think you've caught the jist of my ambivalence. 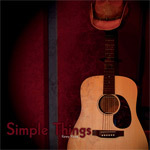 I liked Kenny Young's Simple Things, even though my doubts remain about his vocal performance. At this point, I'm sure my critics and Young's fans will rise up and defense. Good for them. The more I listen the more I'm convinced. Kenny Young's Simple Things is the culmination of lifelong dream: he should be proud of it, and the listener entertained, impressed, and satisfied. Recommended. The more I listen the more I'm convinced. Kenny Young's Simple Things is the culmination of lifelong dream: he should be proud of it, and the listener entertained, impressed, and satisfied.